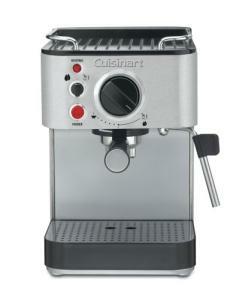 This sturdy and compact espresso maker from Cuisinart has all the features that make for a great coffee making appliance for your kitchen. The question is, does it provide enough features and convenience to compete with others in the price range? The EM-100 Espresso maker is a pump-driven machine capable of coffee brewing pressure of 15-bar, which is sufficient to properly extract all the espresso goodness as well as the rich crema that is craved by aficionados of the stuff. There are a number of useful features including a 52 oz. removable water reservoir, milk frother, and a top that serves as a warming tray for storing and preheating your espresso cups. Adding to the versatility is the ability to brew with ground coffee or coffee pods. The filters included allow you to make one or two cups at a time, and the large size of the water reservoir means less time spent filling and more time brewing coffee. This seems to be a decent espresso brewing machine. The controls are clearly labeled, and the output fairly consistent. Like most of the pump-driven espresso makers, you need to follow the instructions well in order to master it. Cuisinart has included not only an instruction book but also a DVD to walk you through the process. That is a nice touch to keep calls to customer service down with "how does it work" questions. Compare this with the Breville Cafe Roma espresso machine.